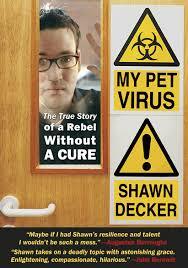 The full title of this book is My Pet Virus: The True Story Of A Rebel Without A Cure. I enjoyed this book so much! Who knew a book about contracting HIV could be hilarious? Decker uses his somewhat twisted sense of humor (my favorite kind) to tell his story. He was born a “thinblood”, which is his word for “person with hemophilia”, and contracted HIV from tainted blood products when he was a child (in the 1980’s, before blood was checked for HIV). This made him a “positoid”, his word for “person who is HIV positive”. He uses words in a creative and unique way.